Ingredients: Active Ingredients: Sodium Fluoride (0.24%) (0.15% w/v Fluoride Ion), Triclosan (0.30%). Purpose: Anticavity, Antigingivitis. Inactive Ingredients: Water, Hydrated Silica, Glycerin, Sorbitol, PVM/MA Copolymer, Flavor, Sodium Lauryl Sulfate, Cellulose Gum, Sodium Hydroxide, Propylene Glycol, Carrageenan, Sodium Saccharin, Mica, Titanium Dioxide, FD&C Blue 1. Active Ingredients: Active Ingredients: Sodium Fluoride (0.24% (0.15% w/v Fluoride Ion)), Triclosan (0.30%). Purpose: Anticavity, Antigingivitis. Instructions: Directions: Supervise children as necessary until capable of using without supervision. Antiplaque and antigingivitis use not proven in children. This product is not intended to replace flossing. For best results, brush twice a day, floss daily, and see a dentist every 6 months. Adults and Children 6 Years of Age and Older: Brush teeth thoroughly, preferably after each meal or at least twice a day, or as directed by a dentist or a physician. Children Under 12 Years: Instruct in good brushing and rinsing habits (to minimize swallowing). Children Under 6 Years: Do not use unless directed by a dentist or a physician. I have tried other toothpastes but Colgate total has my business from now on! It works great and leaves your mouth clean fresh and healthy! Who doesn't want their teeth and gums protected for 12 hours I will never use another brand of toothpaste again! Thanks Colgate Total! It is very unfortunate, that a product that works so well, needed a new label. I don't see any difference in the ingredients compared to the previous packaging, but the new one says "whitens." As a Hygienist, I steer all of my patients away from the whitening toothpastes (sensitivity, lack of adequate plaque control, etc...). And now, being one of only three OTC non-whitening toothpastes that provide full protection, Colgate decided to join the ridiculous marketing strategy and slap "whitens" statement on the label. Come on, guys, do we really need WHITE teeth, or do we just need a good toothpaste that will clean them and provide a healthy intra-oral environment...? It is very unfortunate that a product that works so well needed a new label. I don't see any difference in the ingredients compared to the previous packaging but the new one says &#34;whitens.&#34; As a Hygienist I steer all of my patients away from the whitening toothpastes (sensitivity lack of adequate plaque control etc...). 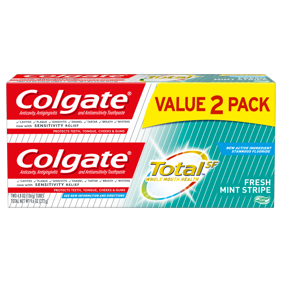 And now being one of only three OTC non-whitening toothpastes that provide full protection Colgate decided to join the ridiculous marketing strategy and slap &#34;whitens&#34; statement on the label. Come on guys do we really need WHITE teeth or do we just need a good toothpaste that will clean them and provide a healthy intra-oral environment...? I love this toothpaste! I love everything about it...the taste the way my teeth feel almost cleaner than after I get them cleaned the tube...I like that the cap is made so that you can stand the tube up. I hope Colgate never stops making this exact toothpaste!